In a heavy 4 quart sauce pot over medium to high heat melt butter. Add and sauté the onions, celery, bell peppers, green onions and parsley until soft. Slowly add the ROTEL tomatoes; increase temperature a little more and stir well. Add the garlic, seasonings, sugar, salt and peppers. Add the corn; when corn seems to be cooked (approximately 25 minutes), add the shrimp and mushroom soups. Mix well and cook approximately 10 to 15 minutes longer. Editors Note: Fresh frozen corn may be substituted, small kernel works best; ROTEL tomatoes are spicy but you can substitute with any whole tomatoes or diced tomatoes and add additional pepper spice or Tabasco. 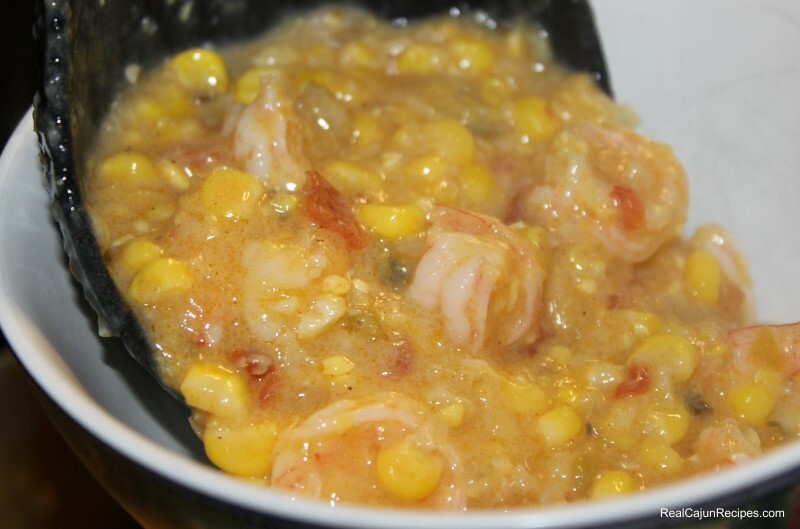 In reducing or increasing the recipe, the author said that he uses one pound of shrimp per 4 cups of corn.